Get your day started on the right foot with this delicious, nutrient dense, green smoothie. Everybody is on the go these days making it difficult to consume your daily amount of fruits and vegetables. Enter the green smoothie. Blending a couple servings of fruits and veggies into a smoothie allows you to consume more at one sitting, improves nutrient absorption and digestion, masks the taste of bitter greens some people can’t stand, and is quick and easy. Once you build a few smoothies on your own you’ll realize how easy it is, and more importantly, perfect the recipes to meet your nutrient and taste bud needs. Ingredient Spotlight: Kale. Kale is a cruciferous vegetable I wasn’t too familiar with until I began blending it into my smoothies. It’s since become a staple in my diet, and as you’re about to find out, one of the healthiest vegetables. 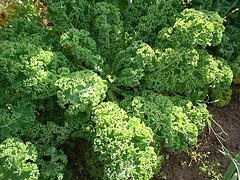 An outstanding source of many vitamins and minerals, kale supports great health and helps the body defend against the ailments of our day. Here are the key health benefits attributed to kale. If you weren’t already, I hope you’re now sold on kale. Enjoy all of its health benefits in this tasty good morning green smoothie recipe. Place all of the ingredients into your high speed blender and blend away for 30-45 seconds or until desired consistency is reached. 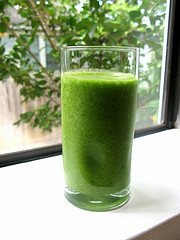 I would love to know if you try this good morning green smoothie – please leave a comment below. Happy Blending! I make a green smoothie similar to this one on a daily basis. Going to have to try this recipe because it sounds delicious and I could use a change of pace. It’s always good to change things up, especially the greens you use in your smoothies, to keep things fun and interesting. Hi, how many servings does this make? New to smoothies! Thanks!! Hi Linda, this recipe is for one large serving. Feel free to adjust the amount of each ingredient to decrease or increase the serving size.